Just months after the publicity fanfare over the sixth Harry Potter book, the fourth movie is about to arrive in the cinema, with Harry facing more danger as he returns to Hogwarts. Director Mike Newell called JK Rowling's Goblet of Fire "a brick of a book", adding it would have been impossible to include everything in just one film. Rather than splitting it in two, large chunks have been slashed, leaving the bare bones of the story of Harry Potter's fourth year at wizard school and his first face-to-face encounter with his nemesis Voldemort. The entire opening has been cut so, this time, the Dursley family do not get a look in. 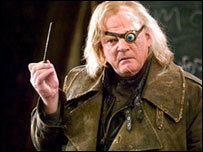 Instead Harry starts out at the Weasleys - unfortunately without Julie Walters (Mrs Weasley). With some of the story glossed over it leaves more time for some impressive set scenes such as the Quidditch World Cup. It is stirring stuff to see the teams whizzing around on broomsticks inside a stadium that reaches into the clouds. The Triwizard Tournament, in which wizards are set potentially fatal tasks, shows off some quality special effects. After the high of the contest comes the news that Voldemort's followers the Death-eaters are regrouping, sparking scary scenes that justify the film's 12A rating (meaning young children cannot see it without adult supervision). An unrecognisable Ralph Fiennes as Voldemort also ups the scare factor several notches. While it is certainly darker than previous films it also displays more of the teenage angst experienced by the wizards in the lead-up to their first formal dance. 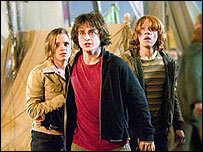 Radcliffe, Rupert Grint and Emma Watson have improved greatly as Harry, Ron and Hermione since their first stilted performances five years ago. Their confidence has grown with age and its now easier to accept them in their roles rather than young actors still trying to find their feet. The new crop of youngsters playing the likes of Cedric Diggory, Victor Krum and Fleur Delacour have wisely been given restricted lines, so their acting skills are not particularly tested. Slick performances come from Alan Rickman as Professor Snape and Brendan Gleeson as Mad-Eye Moody, while Michael Gambon has made Dumbledore his own, having inherited it from the late Richard Harris. Although Newell is new to the franchise, there is no clear difference between his style and previous Potter director Alfonso Cuaron's in The Prisoner of Azkaban, although there was a marked difference between Cuaron and Chris Columbus, who directed movies one and two. Newell has created a polished movie. It will delight existing Potter fans, but, like the later books, it could be too hard for a new audience to follow the complex storylines this far into the series.